Click on the links to learn more about handwashing (in Japanese). Teruterubozu: Rain, Rain, Go Away! Tomorrow is Undoukai Day (similar to a Field Day) at my daughter’s Japanese School. Everyone has been practicing hard for the athletic events and dances for a few weeks. Unfortunately, the weather forecast is calling for rain tomorrow– oh, no! Obviously, the weather is out of our hands, but my kids and I made some teru teru bozu (てるてるぼうず)this morning hoping and praying that the rain will go away. 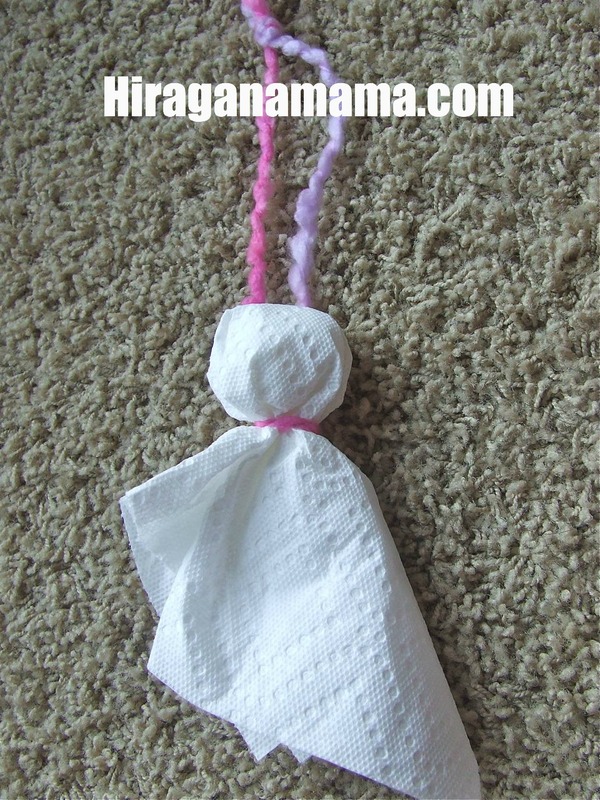 Teru teru bozu is a “sunny-weather-monk” that Japanese children have been making for decades in hopes of good weather. I guess it’s a kind of good luck charm. There is a Japanese children’s song that goes along with this (usually only the first verse is sung), but as you can see, the last verse has a dark twist. Directions: Crumple the tissue into a ball. 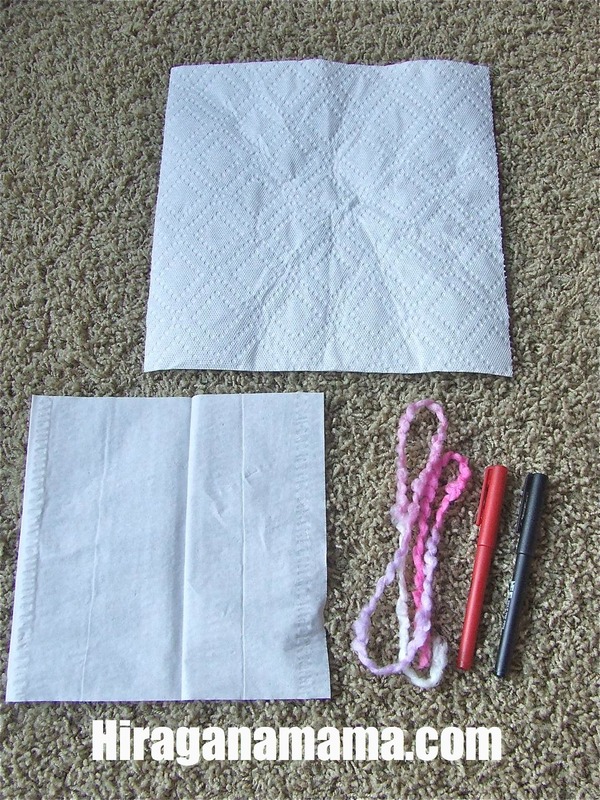 Place the balled-up tissue in the middle of the paper towel, then fold down the paper towel around the tissue to form a round head. Use the string to tie around the neck. Use markers to draw a face on your teru teru bozu. Hang it near a window and hope for no rain! Other ways to make teruterubouzu HERE and HERE. I also sewed one out of pellon and fleece (seen in the first picture at the top of this post)… maybe I can hang it in my car. 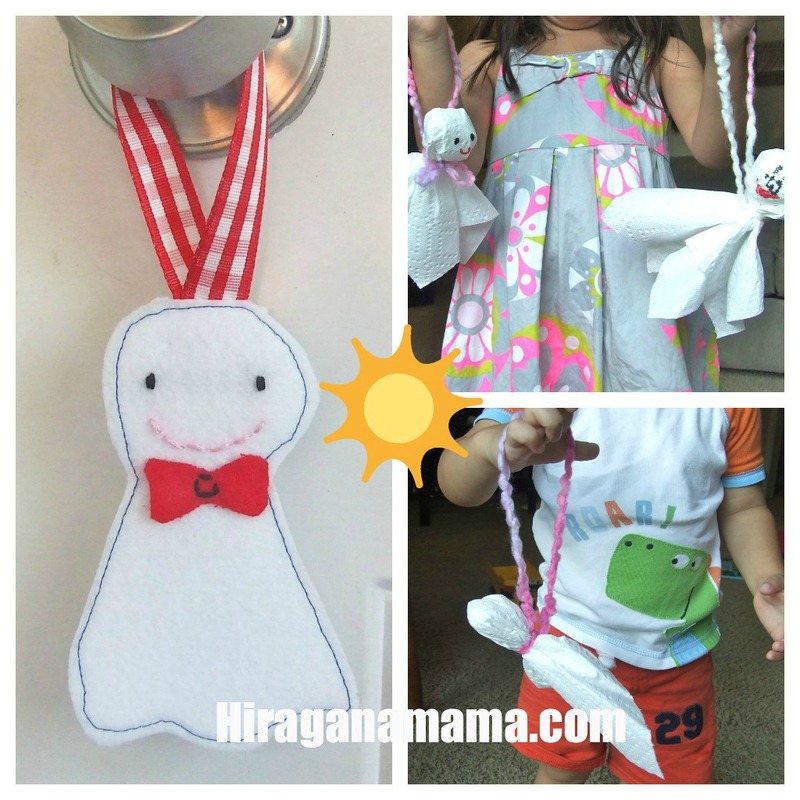 Have you ever made a teru teru bozu? Did it work? Fingerplays (children’s songs with coordinating hand movements) are called Teasobi／てあそび in Japanese. て=hand and あそび=play. One of my favorites is a song called “Hajimaruyo/はじまるよ” which translates to “We’re About to Begin”. It is a great song for getting the children’s attention and getting them settled before giving instruction or reading a book. My Japanese playgroup often uses this song to gather everyone together and it works great! It is also a good song for teaching children their numbers. You can listen/view the song at Teasobi.com by clicking here. てあそびドットコムis a great, great website full of videos, lyrics, and sheet music of popluar children’s songs and fingerplays. They also have handy diagrams for their songs. いたずら天使 is another website that has Teasobi lyrics. Do you have a favorite teasobi?